Today we got a double dose of labs – normally each day of class consists of a half-day of lecture/demonstration and a half-day of cooking lab. Wednesday we got two lab sessions – woo! Tomatoes and/or peppers are elemental foods in multiple cultures: Italian, Mexican, Thai, Korean, etc. Filled with fiber, several vitamins and minerals (notably, vitamin C, vitamin A, and beta-carotene), and antioxidants, peppers and tomatoes are nutritious and delicious. Their color and heat are clues to some of their nutritive properties – antioxidants are often most prevalent in brightly colored vegetables and fruits. 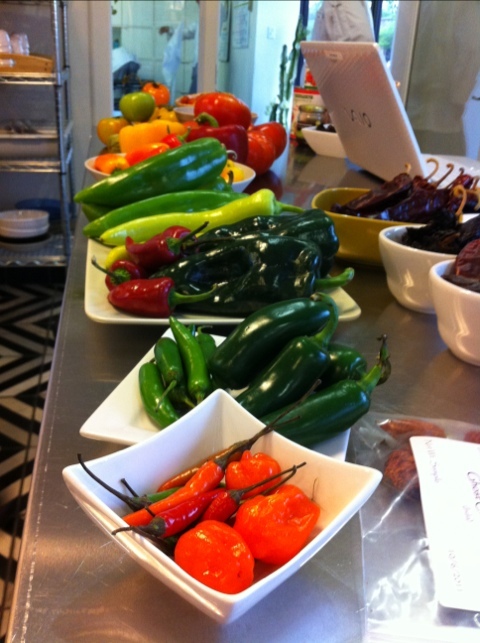 Below: A wide array of shapes and colors were presented in our selection of peppers. At the bottom, habanero peppers and just to the right of that, ghost chiles – the hottest chiles I am aware of.